What are your hopes for the future of lesbian fiction? My hope for the future of lesbian fiction is that it remains vibrant, inspiring and above all, literate – that we continue to write stories that are not confined to the ghetto, but that spread to the wider world. At this time of global chaos, with the collapse of eco-systems and the 6th extinction happening all around us, and yet, with LGBTQ rights under threat in ways we thought were long gone, we need a resilient, informed, emotionally intelligent response that helps people to understand at a core level that we have more in common than that which divides us. The best of lesbian fiction has always offered that. My hope is that it will continue to do so. Manda Scott’s novels have been short listed for an Orange Prize, nominated for an Edgar Award and translated into over twenty languages. She was a long term columnist for the Glasgow Herald, is a reviewer for the Independent and has contributed to the Telegraph, Times, Daily Express and BBC History Magazine. She has appeared on Time Team as an expert on the Boudican era and contributed to Radios 4 & 5. Her most recent release is Into The Fire, a dual timeline mystery set in 2014 and 1429. Outside of the lesbian book-reading community, I feel that lesbian fiction – with a few notable exceptions – isn’t highly regarded. For a change to take place, our authors may need to widen the scope of their work. I’ve said this before, but the number of respected mainstream lesbian authors can be counted on the fingers of our hands and this list hasn’t altered very much in years! I’m glad that there are many younger authors coming up, some I very much admire, so I do believe that the situation is going to get better. VG Lee is the critically acclaimed author of five novels: The Comedienne, The Woman in Beige, Diary of a Provincial Lesbian, Always you, Edina, and her latest release Mr Oliver’s Object of Desire. In 2012 VG Lee was nominated for a Stonewall Award for writing and in 2014 she won The Ultimate Planet award for Best Established Author. In her sixtieth year she decided to become a stand-up comedian and is now a regular performer at Laughing Cows comedy nights in London and the Midlands. I’m really blessed that UK Lesfic was around when I started publishing books. Being an author is a wonderful career but it’s a really tough to establish yourself in a busy marketplace and having you guys supporting and cheering made a real difference. It’s been fantastic from my point of view to watch your own efforts, hard work and talent get more and more recognition. I’ve been cheering you guys too. I think it’s important that, like a wonderful friend wanted, the bar is raised and continues to be raised. If we are respected for the polished prose, story-telling ability and high-quality of our work then our authors will be in a better position to reach, entertain and promote understanding in readers. I’d like to see more family friendly fiction with an emphasis on showing a positive, uplifting message that you can be sassy and classy. It’s important that message is clear. Self-respect is something I feel passionate about. I’d like any reader to be able to pick up my work and feel that they are unique and deserve respect whoever they are. The community is blessed with a perspective of what intolerance feels like and why it’s all that more important that to understand the right to be happy and loved should be universal. Men’s strengths are often displayed in fiction but everyone seems to miss that women are incredible. We step up when needed; we run homes, work long hours, raise children (or furries,) seek to help others, feel compassion for others, take on so many different roles at once yet, usually, without complaint or hesitation. No, we roll up our sleeves and get on with making a difference every day. I try very hard to show that strength in my characters. I try to show just how beautiful we are as human beings inside and out. I hope it shows: Sassy but classy, intelligent and kind, compassionate yet strong and we should demand high-quality fiction that gives us the respect we deserve. Jody has been everything from a serving police officer, to recording artist/composer and musician until finding her home in writing. She lives in sunny South Wales in the UK with a ‘lively’ golden retriever called Fergus and other furry friends. She has four books released in the Above and Beyond series, and two in the Renovating Hearts series. You can find out more about her and her novels here at her blog. This was obviously the only lesbian author they’d ever heard of and I could only nod and say, “yes, like Sarah Waters”. Well, unless any of my books get made into TV series or films, I’m not likely to become that well known. But this is what came to mind when I thought about answering this question – what are your hopes for the future of lesbian fiction? I hope that it will continue to flourish and grow. We need a strong presence—visibility—in the world, now as much as in earlier times. As both a writer and a reader, I want to create and read stories about lesbians who come across as real people leading normal lives, free to love who they want…not portrayed as monsters to either be hidden away or destroyed. Later on, at the course I mentioned above, one young woman asked why I referred to my books as ‘lesbian romance’. Why didn’t I just describe them as ‘romance’? I don’t know what answer I gave her, but thinking about it now, my answer would be that a separate genre is necessary so that we can find books about ourselves. Maybe, in time, that will change too. A time when Sarah Waters won’t be the only name that defines lesbian fiction. A time when we no longer need a neatly labelled niche to share our stories with the world. Jen lives near Hebden Bridge in West Yorkshire with her long-term partner whom she married in December 2014. She has always enjoyed reading an eclectic range of genres including sci-fi, fantasy, historical fiction and lesbian fiction. As well as reading and writing, other activities include golf, archery, and taking part in archaeological digs. Jen’s latest novel, Christmas at Winterbourne, was published by Affinity in October 2016. As I wrote this blog I began to think about what it means to have hope, after all hope is one of the most important strengths an individual can possess. It takes tremendous tenacity, resolve, vision, belief, and courage to hope for something. It is at the heart of the human spirit. Without hope very little can be achieved. Have you noticed that hopeful people are rarely naive fools, but individuals who have spotted the possibility of something – they have seen what others blinded by scepticism may have missed. The hopeful see the potential in things. Hope, like optimism, is infectious. A hope which is shared by others has energy to it and gathers a momentum which builds and grows to the point where it is unstoppable. So with this in mind here are my hopes – I hope that we will continue to promote and carve out the physical and emotional space we deserve for the literature we cherish. I hope that we will remember the writers who went before us, who bravely put into words what many could not speak. And I hope that we will have the same self-belief and courage as them as we continue to imagine characters and narratives that console, captivate and inspire. The only limit for the future of lesbian fiction is our ability to have hope for it. I know that what we hope for together, as writers and readers, we can and will achieve. Anna has a degree in English Literature and Master’s degrees in The Word and Visual Imagination, and Museum Studies. She has written and curated a permanent exhibition of LGBT voices and memorabilia, based at Leicester’s LGBT Centre, one of the first permanent exhibitions in the UK. As a former member of the Steering Committee for the Leicester, Leicestershire, and Rutland LGBT History Project, Anna is passionate about preserving LGBT history and ensuring that LGBT voices are heard. Anna’s debut novel, Highland Fling, was published by Bold Strokes Books in April, 2017. Crikey, no biggie then. I’d say the future for lesbian fiction looks bright – there’s never been a better time for lesbian fiction than now. More choice, more authors, more books, more sub-genres – you name it, it’s here. But what I’d like to see is more crossover into the mainstream and more coverage in mainstream media. I already know it’s not just lesbians who read my books – they’re enjoyed by a cross-section of people representing all flavours of the sexuality and gender spectrums, which is great. But I’m greedy – I want lesbian fiction to have a positive impact on more lives around the globe, to see our lives reflected back not just to us, but to millions more. And as the world gets more connected every day, the growth potential is there.Lesbian fiction to the masses! Hurrah! Finally, in the romance and crimes genres especially, we have some cracking stories just begging to be made into films or TV. So my ultimate hope would be to see these stories hit some kind of screen, large or small, and watch their reach widen even further. Why not Cari’s Dark Peak series or my London Romance series on Netflix? Why not Tig’s Poppy Jenkins as a movie? I’d be watching, and I wouldn’t be the only one. Thanks to you two for shining a light on UK lesfic over the past few years and for taking part in the rise of lesfic. When I first started writing, your site was invaluable, and you’ve been a constant support to countless writers over the past three years. We all owe you both a debt of gratitude. Clare is a London-based writer of contemporary lesbian romance. She’s a No.1 best-seller on lesbian fiction charts around the globe with five full-length novels to her name, as well as writing the All I Want series, which concluded with its sixth instalment, All I Want Forever in January, 2017. 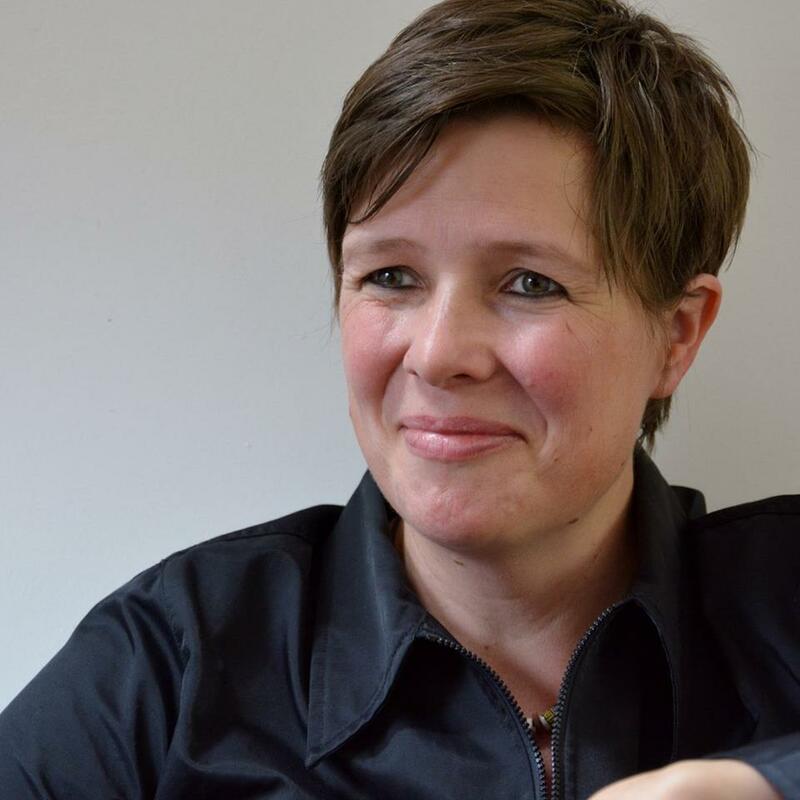 Clare is a lively and enthusiastic member of the UK Lesfic community and regularly hosts the Lesbian Book Club podcast over on the Lesbian Lounge. I still remember how exciting it was to go into Gay’s The Word as a fledgling, still in the closet, wet-behind-the-ears lesbian, and discover shelf upon shelf of lesbian fiction. My girlfriend (now wife!) and I bought a copy of Sarah Dreher’s Stoner McTavish and dashed back a few days later to buy every other book in the series. Almost twenty years later, fledgling lesbians are spoiled for choice in terms of lesbian fiction. As mainstream authors still have a tendency to sideline or closet their LGBTQ characters, the small presses and the indie authors have stepped in to fill the void, and they’re doing it in a considerable amount of style, climbing the bestseller charts, and proving that UK lesbian and bisexual authors are writing and that, more to the point, they’re being read. My hopes for the future of lesbian fiction, then? That our community continues to thrive and to grow, and that the mainstream publishers and the mainstream media eventually sit up and recognise that we’re here and that we’re worth supporting. That UK authors continue to set their books within their own regions, and write in their own dialect, chucking in slang and foodstuffs that make people scratch their heads and hop over to Google. When it comes down to the nuts and bolts, I hope authors continue to write and readers continue to read, because that will ensure that lesbian fiction continues to exist. Cari Hunter lives in the northwest of England with her wife, their cat, and a pond full of frogs. She works full-time as a paramedic and dreams up stories in her spare time. Although she doesn’t like to boast, she will admit that she makes a very fine Bakewell Tart. Cari has just finished a new crime series based in the Peak District. The first book – No Good Reason – won the 2015 Best Lesbian Thriller/Mystery Rainbow Award, and its sequel Cold to the Touch won a Goldie and a Rainbow Award for Best Lesbian Thriller/Mystery. The third book in the series – A Quiet Death – was published in January 2017. Most of all I hope people keep writing, whether it be that detective of iron integrity or the hapless heroine of the romcom who wakes up in the armpit of the wrong woman. Comfort reads that delight even after the tenth reading are magic and a nugget of happiness for many. A broad range of literature is essential for expanding your horizons and developing empathy towards others but finding yourself represented, validated and worthy of a happy ending is precious. So please, keep writing! Clare Ashton lives in the Midlands with her partner and two lovely distracting kids. She loves a moody atmospheric novel but she’s a big softie inside and can’t resist writing romcoms. Her latest award-winning romance is Poppy Jenkins. So for one last time: that’s all folks, from Cari and Tig. Thank you for four years of excellent information. Hopefully someone will continue your effort. Reblogged this on anna larner. Thank you for the years you have shared the happenings of writers ‘across the pond’. I will miss reading about the new book releases, but now feel as though I know the authors here. I will continue to follow you all and look forward to new titles in the future. Take care, everyone! I’m sad you’re ending, but thank you for all the hard work. I look forward to future fiction from you two and the other authors you’ve featured.